PF contribution rate of employee and employer was defined as per EPF Act and mandatory to follow. Any company over 20 employees is required by law to register with EPFO. This is a retirement benefit scheme that is available to the salaried individuals. This is maintained by the Employees’ Provident Fund Organization of India. In this post you will learn all about Employee Provident Fund (Epf) contribution rate of employee and employer. Pf contributions are made on a monthly basis by both employee and employer. Currently, the following three schemes are in operation under the EPF Act of 1952. Your monthly pf contributions are break down into 3 portions and shared among these schemes. EPF, EPS and EDLIS are calculated on the basis of your Basic + Dearness Allowance (DA). Don’t get confused between epf and eps. This is most common doubt among employees who contribute to epf scheme. 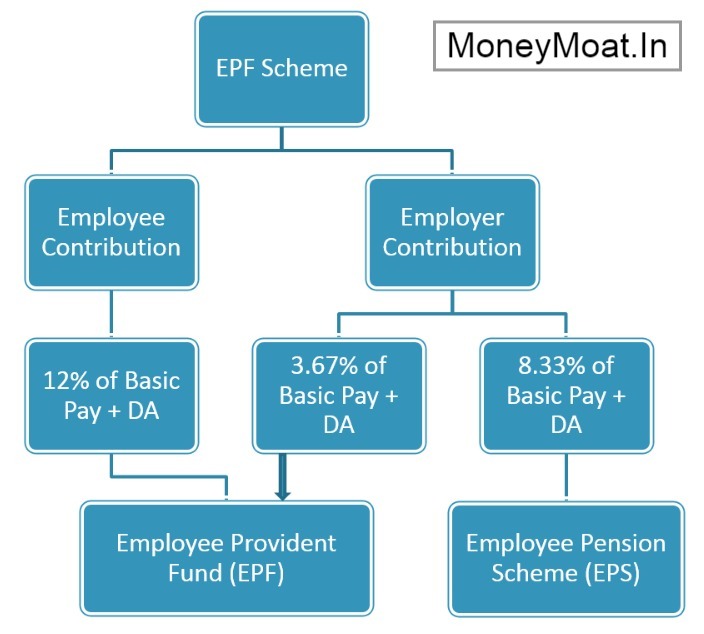 The part of employer contribution to pf account goes in Employees Pension Scheme (EPS) fund. This part of epf contribution is the pension contribution in EPF. So, whenever we talk about eps, it is the pension contribution in pf. The breakup of the epf contribution is different for the employee and employer. 12% into EPF (This comes out of the employees’ salary). As you can see, your contribution as an employee do not contribute to the pension scheme, life insurance premium charges and administrative charges. Employer contribution goes into these schemes. Your contribution goes solely towards your EPF account. I will explain more about EDLIS in my next post. For now lets stick with main topic of Employee Provident Fund Contributions breakup rate in detail. Pf contribution by employee is 12% of Basic Pay + DA and same amount will be contributed by employer. However, when the current income is more than minimum wage ceiling of Rs.15000, three standard methods are employed for calculating the contribution amount. The employer is free to use any one of the following methods. Please note that the following table shows only EPF contributions but not EPS & EDLI for better understanding. Method 1: In this case, employee contributes 12% of basic pay plus Dearness Allowance towards EPF account. Whereas, employer contribution to EPF will be 12% of basic pay minus 8.33% of Rs.15000 (Wage Ceiling as on writing post). I will explain this with an example later in this post. Method 2: In this case, employee contributes 12% of basic pay plus Dearness Allowance towards EPF account. Whereas, employer contribution to EPF will be 3.67% of Rs.15000. Method 3: In this case, employee contributes 12% of Rs.15000 to EPF account. Whereas, employer contribution to EPF will be 3.67% of Rs.15000. You should note that, employee contribution of 12% is mandatory. Employee can increase his contribution as he want. But employer contribution cannot be more than the amount mentioned among the 3 methods. Usually, employer contribution will be 12% of basic pay or 12% of Rs.15000. Among the methods i have mentioned above, only 3.67% of Rs.15000 go to EPF account and remaining 8.33% go to EPS (Employees Pension Scheme). Let me explain the amount goes toward EPF account in the three methods mentioned above and the amount goes into EPS with an example. To understand better, i will consider 2 cases. Employee B income is Rs.25000. Here, employee A income is less than Rs.15000. Hence, there is no ambiguity in contribution amount. Both employee and employer contribute 12% of income. Now, Employee B income is more than Rs.15000 i.e., Rs.25000. In this case employer has a choice to chose among the 3 methods explained above. If the employer chooses method 1, the employee and employer contributions breakup will be as follows. As i already told, an employee has a liberty to contribute at a higher rate to the EPF but the employee has no right to ask for higher employer contribution to match employee contribution. Employer can choose any option mentioned above. You can always enquire about epf balance on UAN member portal. I have written a post on How to Check Pf Balance online. Please read that post if you don’t know how to do it. This is how epf contributions are calculated. I hope, i have explained how pf contribution of employee and employer breakup in detail. If you still have any doubt, kindly leave a comment below. I will try to answer your questions. Thanks for reading this post.